You’ll recognise the Elddis badge, of course. But, Sanremo? That’s the name given to a seven-model line-up of special edition caravans exclusive to Venture Caravans. Venture’s Sanremo’s were introduced this season, making it one of eight dealers doing special edition variants of Elddis’s standard-issue tourers. 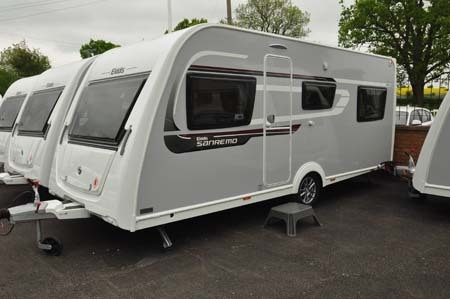 At prices around £1,000 more than the Xplore models on which they’re based – yet boasting a vastly superior specification, inside and out – the “Sanremo look” kicks off in style with alloy wheels and bodywork sides in silver/grey. Construction is Elddis’s highly regarded screw-and timber-free SoLiD, but here the sides are in GRP rather than the usual aluminium. It’s all backed by the usual ten-year warranty, though. 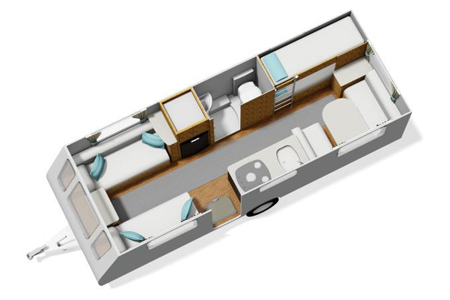 The 526 is a particularly family-friendly six-berth, thanks to a floorplan that gives you two fixed bunk beds in the rear offside corner, adjacent to which is an extended dinette which, in turn, can be made into a further two bunks. The facility to close off the whole “back bedroom” area once the kids are put to bed is one that won’t be lost on parents. It’s even set up for watching TV in here. Likewise, the Sanremo spec adds appropriate wiring and a bracket for a flatscreen TV in the front lounge, where there’s also a stereo radio/CD. Eschewing the current trend for extra deep front windows and sunroof arrangements, the roomy lounge looks out via a single, opening full-width window, also benefiting from a Heki rooflight overhead. There’s a small fold-up table top for occasional (ie drinks/snacks), or it’s not a challenge to reach out to the dedicated locker for the free-standing table. 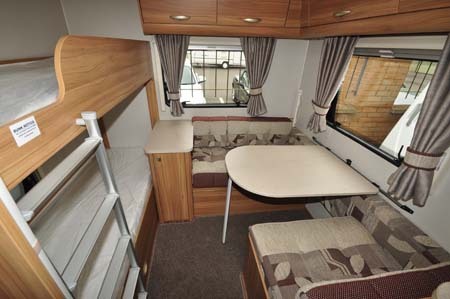 That upholstery – called Riviera – represents another upgrade over the standard Elddis product. 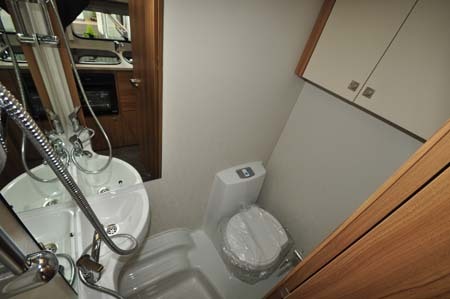 The kitchen and washroom are ‘midships nearside and offside respectively. The former is particularly well up-specc’d, especially bearing in mind expected family use where on-board catering usually takes a much higher priority. There’s a dual-fuel hob (one electric hotplate, three gas rings) plus a Thetford Duplex oven/grill combination unit, supplemented by a Daewoo microwave oven. The sink, in black to match the hob, is decently deep, with space to its left for worktop and/or adding a drainer. 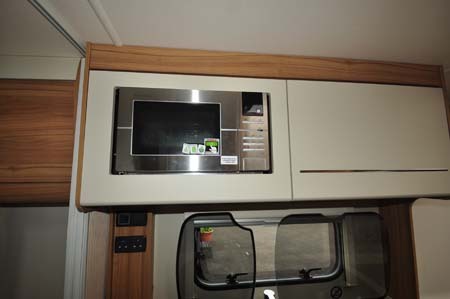 Despite this enhanced kitchen kit list there’s still a decent amount of storage – a single overhead locker is fitted out with crockery racks, while in the main unit itself there are two drawers and three cupboards. Across the way, the Dometic 8-series fridge can offer a cooling capacity of up to 110 litres, if you prefer to remove the freezer box. Above this is a double-doored wardrobe. The washroom adjacent is admittedly not the largest, and you’ll find things are noticeably cramped when it comes to showering. It also sports the most meagre of washbasins, and a single towel holder is also a bit mean. Like the kitchen, the taps in here are from Caraflo, and you’ll certainly get a good supply of hot water via the Whale boiler. Heating is also courtesy of Whale, and it’s a unit that has a better performing thermostat than most – that’s something to bear in mind if you like to leave your heating on a low setting through the night. Venture even seems to have nailed it on price. 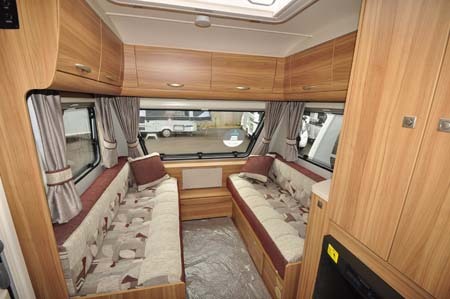 Elddis’s own Xplore 526 is some £15,494 and has a maximum weight of 1,350kg. This Sanremo variant, despite all its extra kit, is down to an MTPLM of 1,317kg and still has a reasonable 197kg payload. It’s extremely good value too, at £16,490 – or, if you prefer, less than £2,750 per person! There’s more information on the Sanremo range on the Sanremo website. To find out more about our low-cost premiums visit the caravan insurance discounts page. 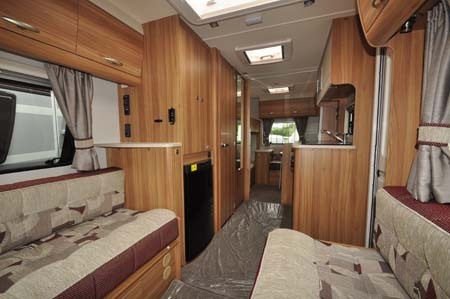 Alternatives: Elddis Xplore 526, Elddis Breeze 526 (from Raymond James). 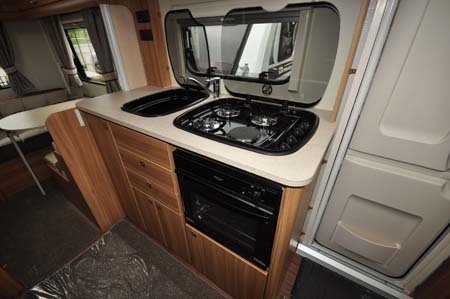 *Caravan insurance cost based on Elddis Sanremo 526 retailing at £16,490 fitted with hitchlock and wheel clamp. Caravan insured on a new for old basis. Kept on drive at HX4 0BE. Caravanners over 30 years old, claim free for 3 years and a member of a caravanning club. £100 excess. 180 days European cover and up to £75 per day for up to 15 days emergency accommodation cover included. Legal expenses cover, extended European cover and other emergency accommodation expenses cover options are available at extra cost. Quote includes 10% online discount and 6% Insurance Premium Tax and is correct as of 26/05/2015.